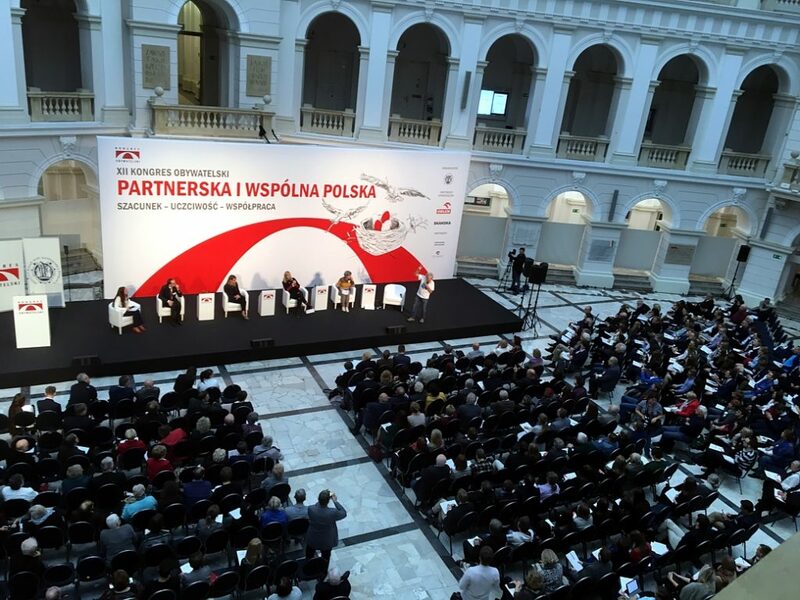 “Partner and Common Poland” was the slogan of the 12th Civic Congress held in the Main Hall of Warsaw University of Technology on October 28, 2017. The Congress was organized by Gdansk Institute for Market Economics. The “PAFF Local Partnerships” Program was a partner at the thematic session titled “Local Development Based on Partnership”. The Congress was opened by Dr. Jan Szomburg, President of the Management Board of Gdansk Institute for Market Economics, who was the Congress Initiator. During the plenary session opening the Congress, speeches were given by Prof. Jan Szmidt, President of Warsaw University of Technology; Wanda Traczyk-Skawska, Master Corporal and Liaison Officer in Warsaw Uprising, Chairperson of the Civic Committee for Establishing Warsaw Insurgents Cemetery; Prof. Andrzej Leder, Institute of Philosophy and Sociology, Polish Academy of Sciences; and Paweł Musiałek, Member of the Jagiellonian Club Board. The speakers shared with the Congress participants their thoughts about the idea of partner and common Poland. Then there was a session on partnership challenges in various spheres of life, where practitioners – representatives of various coalitions took the floor. The moderator of the debate was Dr. Małgorzata Bogunia-Borowska, representative of Jagiellonian University, and member of the Civic Congress Program Board. Sharing their experiences were: Prof. Krystian Jażdżewski, representing the Partnership for Early Detection of Cancer in Poland; Fire Captain Agnieszka Wojciechowska, who spoke about the partnership in a team; Dr. Aleksandra Przegalińska, Kozminski University, an expert in artificial intelligence and automation; Ewa Kipta of Revitalization Forum Association who spoke about a partnership for space; and Aleksander Doba, traveler, who shared his experiences on partnership in implementation of big projects. The thematic session partnered by the “PAFF Local Partnerships” Program focused on local development based on partnership. 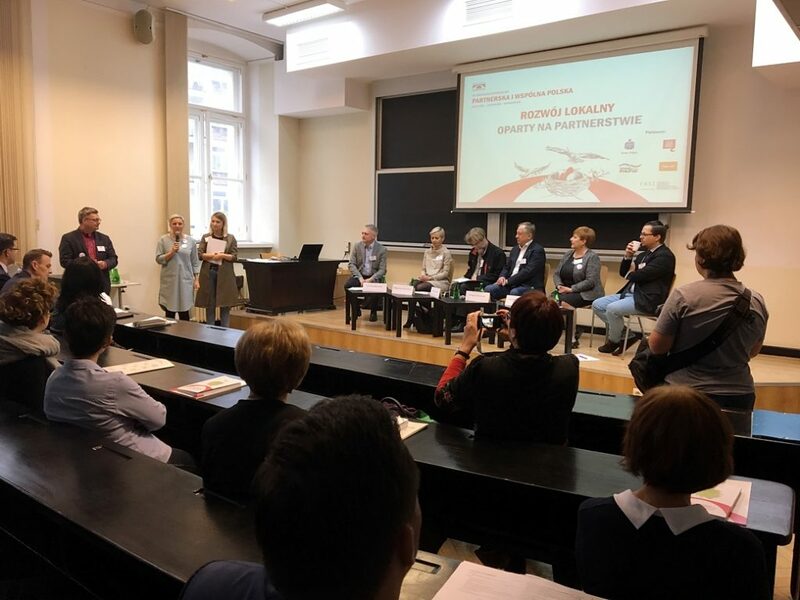 During the panel, the Program was represented by Małgorzata Dąbrowska, head of Bończa village, PAFF Leader, member of the PAFF Local Partnership established for “Apple Warka – Fruit of Our Passion” project. Speaking about her experiences gained in the program, Małgorzata Dąbrowska emphasized that if you want to establish a partnership, you should look to what unites people. When you work in a team, it is involvement and respect, honesty and cooperation, and not statistics, that count. In Warka, this principle works so well that the project intended to last for a year turned out to be only the introduction to further campaigns. A big group of partners and residents of the commune cannot think of Warka with no more partnership projects. The other panelists, namely Marcin Skrzypek, a social and cultural leader of TNN Grodzka Gate Center, Lublin; Artur Celiński, Res Publica; Grzegorz Molewski, Cinema around the Corner Coordinator; Grażyna Szafraniak, the Director of Jakub Wojciechowaki Barcin District and Commune Public Library (a participant in the Library Development Program) shared their afterthoughts on various aspects of partnership functioning. Marcin Skrzypek compared building partnerships to the work done by bees. He also referred to space organization, which has an impact on people’s perception of the world. Grażyna Szafraniak and Grzegorz Molewski pointed to the importance of the culture for local development. Artur Celiński pointed to the importance of ability to communicate with various partners. The moderator of the session was Jacek Królikowski, President of the Board of the Information Society Development Foundation, who in his concluding speech emphasized the value and importance of the common good in the process of partnerships building. Next, the participants of the meeting asked questions, e.g. on how to get residents involved in projects, on various legal and institutional issues, and existing models of partnerships. At the end of the meeting, Wojciech Kaczmarczyk, the Director of Civil Society Department, Chancellery of the Prime Minister; Piotr Krasuski, the Director of the European Social Fund Department, the Ministry of Development; and Dr. Marek Rymsza, advisor to the President of the Republic of Poland referred to the discussion. The Ministry of Development representative emphasized importance of social capital as an element of development. He said he believes that is the element decisive for success of activities, and therefore it is important for partnerships to develop that capital. In turn, Wojciech Kaczmarczyk noted the role of NGOs, and said that the local development based on partnerships would not be possible if NGOs didn’t support it. While the President’s advisor mentioned about inequalities that exist in a partnerships established between NGOs and self-government bodies. The session was also a good occasion to present “We help local Poland spread its wings” report summing up the 3-year round of local debates project. The debates were organized in cooperation with the Information Society Development Foundation and held in public libraries supported by the Library Development Program. The local organizers of these debates were presented with diplomas with acknowledgements for their organization by Dr. Marek Rymsza, acting on behalf of President of the Republic of Poland Andrzej Duda, and Małgorzata Stompór, a member of the Management Board of the Gdansk Institute for Market Economics, the organizer of Civic Congress. The Civic Congress is a forum for public debate on directions of further civil society development in Poland. Each year, the Congress is participated by about 1,000 people, including representatives of central and local administration, NGOs, academic, student, and business environments, as well as residents of various regions, cities, towns and villages. The Polish-American Freedom Foundation has been the Congress partner since 2005. The objective of the “PAFF Local Partnerships” Program is to initiate and develop cooperation of participants of the Polish-American Freedom Foundation various programs who establish partnerships in order to implement projects important for local communities. Under five editions of the program, a total of 38 partnerships participated by almost 600 partners have been established in 85 communes.